This is directly affecting your present and future! Whether you realize it or not, the past is haunting you. Unexplained fears, strange dreams, odd birth marks, moments of deja vu ... these mysteries can be explained by delving into your past lives! Edgar Cayce was one of the world's foremost psychics in the early 20th century, with a gift for both predicting the future and reading past lives. Based on his studies, the Edgar Cayce Past Life Report uses your unique birth chart to reveal the energies, lessons, and personalities of your previous lives that are still influencing you today. Go back to learn from and let go of the past so you can reach your full potential in the present. 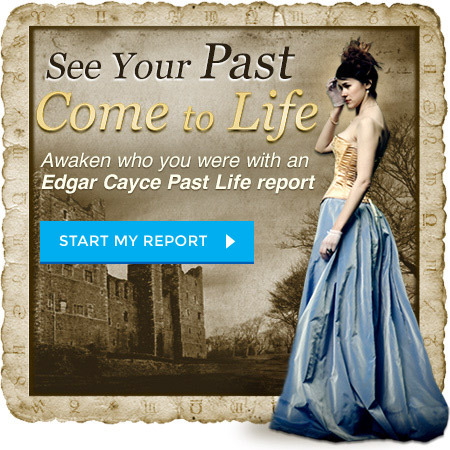 Explore the depths of your origins with an Edgar Cayce Past Life Report now to make the most of this life! You can also step through this doorway in time for free with TrialPay.